Patented nozzle technology provides better atomization for maximum horsepower! The just released ZEX Race EFI Nitrous System incorporates several nitrous technology breakthroughs; making it the perfect choice for serious race applications. One such patentworthy advancement is ZEX’s Fuel Shear technology, which injects the enrichment fuel directly into the center of the nitrous plume yielding total and even fuel atomization. As with every ZEX nitrous system, the new Race EFI System includes the tuning and safety feature that has revolutionized the nitrous industry – Active Fuel Control. Fuel enrichment is automatically adjusted in accordance with bottle pressure, so tune-ups stay dead-on despite bottle pressure fluctuation. In addition, the Race EFI Nitrous System also utilizes a patented electronic TPS switch for perfect system activation at wide-open throttle. 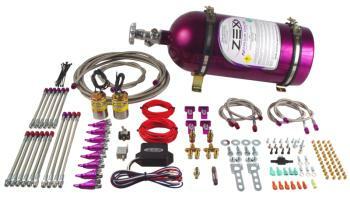 Tunable from 100 to 250 horsepower, the new ZEX Race EFI Nitrous System is compatible with any fuel injected engine.